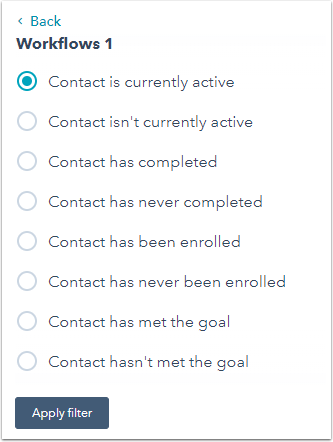 Lists help you identify and organize your contacts by traits they have in common. 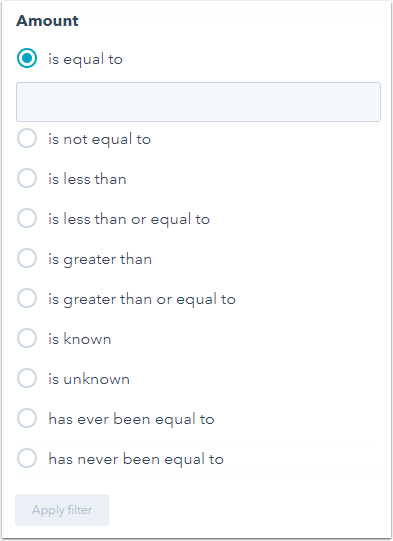 By seeing all your options for list segmentation and understanding what your marketing goal is, you can determine which criteria makes sense for creating your list. 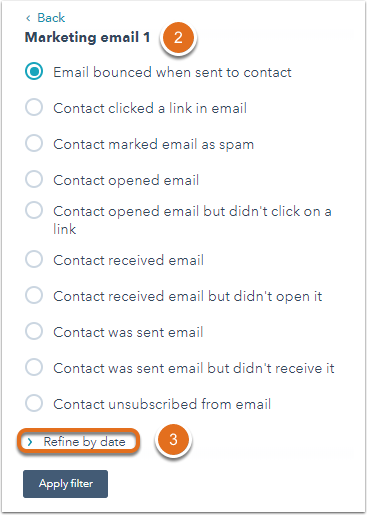 These list criteria can be combined in multiple ways to filter contacts on more granular levels. 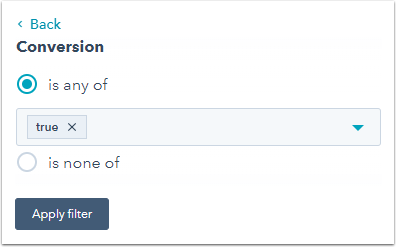 Please note: list segmentation criteria in Marketing Hub Starter accounts is limited to form submission data, contact property information, and marketing email activity. contacts with an associated deal with the deal property Amount greater than $5,000. After selecting a property, you'll see the specific options available for filtering. This differs based on the property's field type. 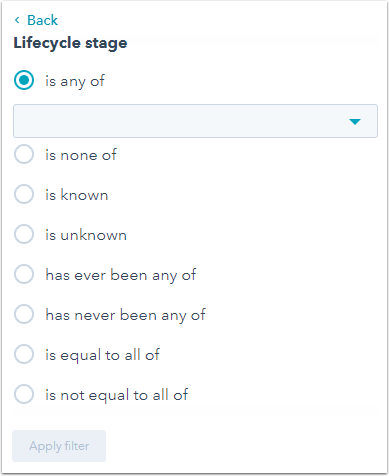 For example, the HubSpot Lifecycle Stage contact property is a radio select field type, so you can select existing or historical option values. When selecting is unknown, the list will include objects with the property being empty. If the object's property contains 0, this is a known value and the object will not be included in the list. When selecting is known, the list will exclude objects with the property being empty. If the object's property contains 0, this is a known value and the object will be included in the list. 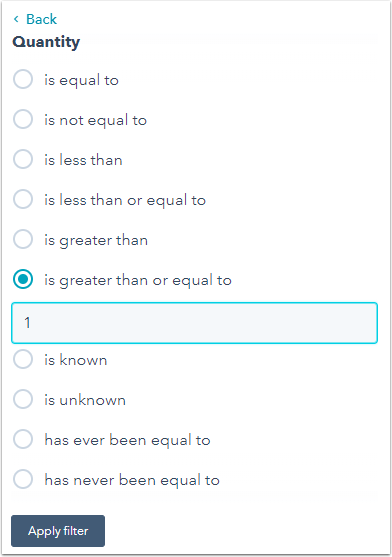 When selecting is equal to and entering 0 in the field, the list will include contacts with an empty property and contacts whose property contains 0. When selecting is less than or is less than or equal to, the list will include contacts with an empty property and contacts whose property contains 0. 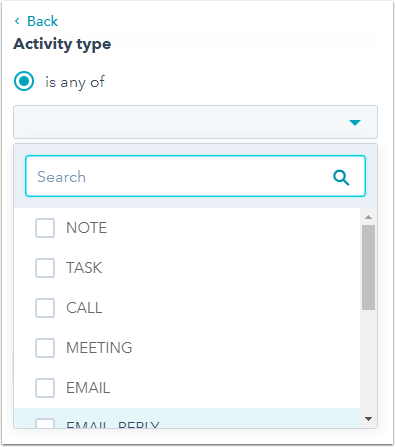 Filter contacts by activities on their contact record. 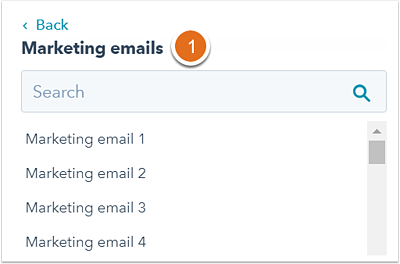 Activities include meetings, conversations, tasks, notes, one-to-one emails, and phone calls that have been logged in HubSpot and you can filter a contact based on the activity details. 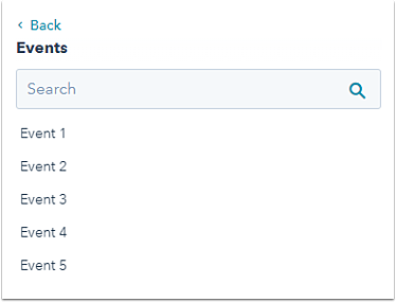 Learn more about using activity properties in a filter. For example, you can create a list of contacts who have had a certain type of activity on their contact record. Filter contacts by the properties of a line item in an associated deal. For example, you can create a list of contacts with at least one associated deal that has at least a product with the Quantity of 1. Filter contacts by their list memberships. This filter can help you to combine different lists. Select the specific form. This will filter out all contacts who has submissions to this specific form. 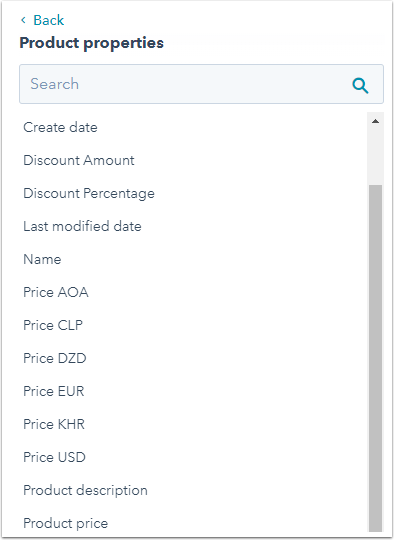 After selecting the specific form, in the dropdown menu, select a specific page. This will filter out all contacts who submitted to the specific form on that specific page. Select Any page if there is no specific page. Refine the submissions by date and by the number of times a contact submitted to the form. This step is optional. Select the specific marketing email. 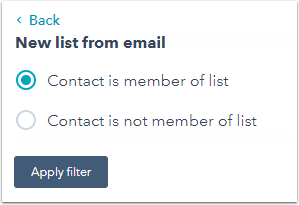 After selecting the specific email, select the activity to filter the contacts by. 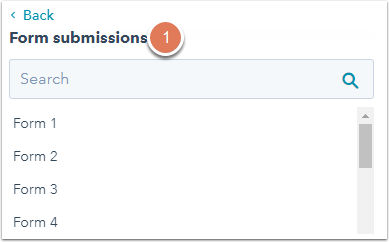 Refine the submissions by date. This step is optional. 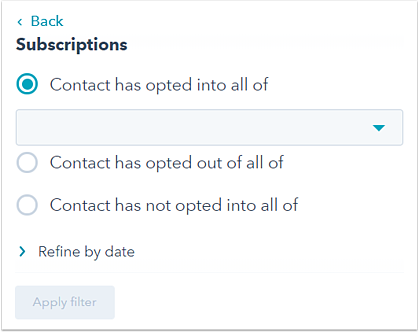 Filter contacts based on the status of their email subscriptions. 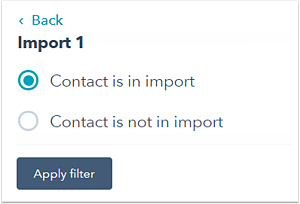 Filter contacts based on the import they were part of when they were added to HubSpot. 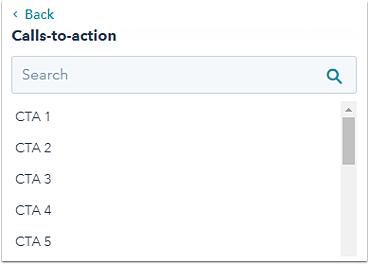 Contact has/has not visited exact URL: contacts who has a page view in their contact record timeline that matches the exact URL specified. For example, entering http://www.domain.com/pricing/marketing will show contacts who have or have not visited the specific tracked page containing that exact URL. A wildcard (*) will not work. For example, entering /marketing will show contacts who have visited a page on your website that contains /marketing in the page URL such as http://www.domain.com/marketing/trade-shows or http://www.domain.com/contact/marketing-company. A wildcard (*) will not work. 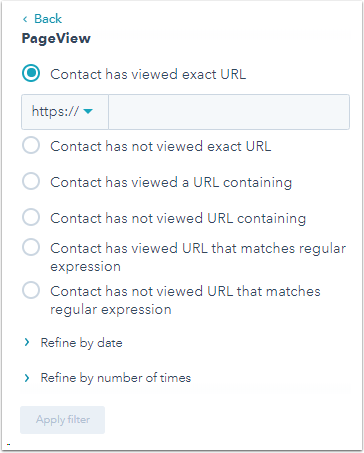 Contact has/has not visited URL that matches regular expression: also known as regex, this is an advanced functionality that HubSpot Support does not support, so it should only by implemented by users who are familiar with regular expressions. RegExr is a helpful website to learn, build, and test Regular Expressions. If it takes HubSpot's internal processes more than one second to test a contact against a condition using a regex filter, HubSpot will automatically return a value of false, and the contact will not pass the evaluation for that filter. A wildcard (*) will work in this option. Visits to file manager file URLs are not tracked. If you enter a file URL in your page view filter, no contacts will meet your list criteria. HubSpot strips UTM parameters from the visited URLs on contact records. Learn more about how query string parameters are handled in lists and workflows. The page view option is only available for Marketing Hub Professional and Enterprise accounts. Filter contacts by the products in their associated deals. Filter contacts by events they've completed, and refine this by date or number of times. For example, you can create a list of contacts who have completed a specific event at least twice. Please note: the event option is only available for Marketing Hub Enterprise accounts. 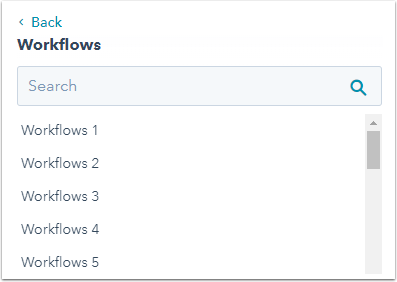 Filter contacts by workflow status. For example, you can create a list of contacts who are currently active in a specific workflow. Please note: the workflow status option is only available for Marketing Hub Professional and Enterprise accounts. 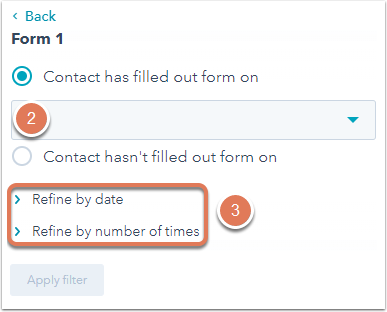 Filter contacts by a call-to-action (CTA) status and refine this by date or number of times. 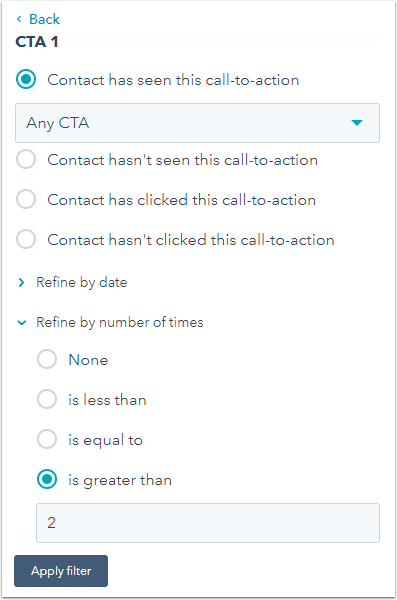 For example, you can create a list of contacts who have seen all variations of a specific CTA more than twice. If you've integrated GoToWebinar with HubSpot, you can filter contacts by their GoToWebinar webinar status. 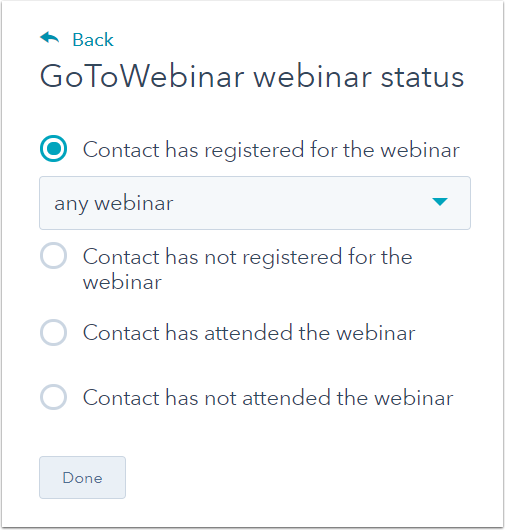 For example, you can create a list of contacts who have registered for any webinar, or have not attended a specific webinar. 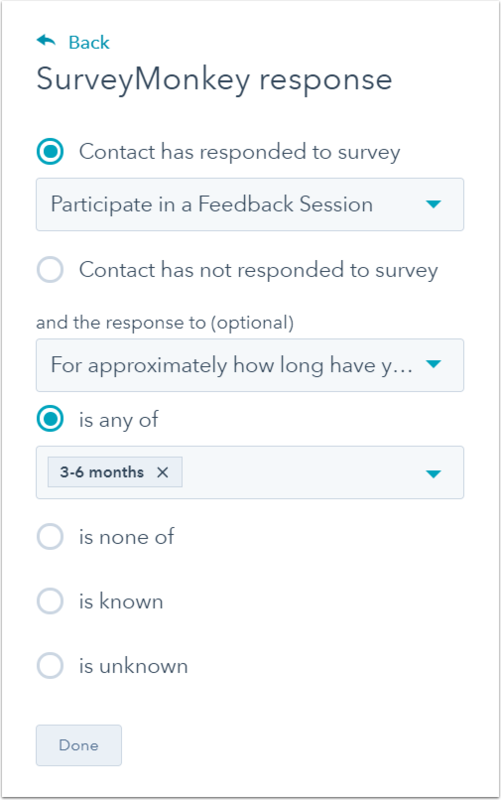 If you've integrated SurveyMonkey with HubSpot, you can filter contacts by their SurveyMonkey survey response. For example, you can create a list of contacts that have responded to a specific survey, or even given specific answers to questions in the survey. 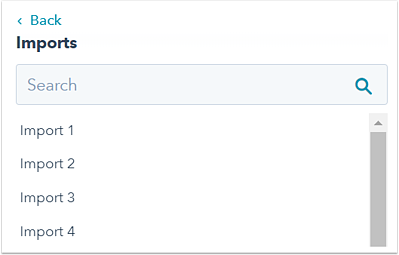 filter contacts by the corresponding AdWords, Facebook Ad, and LinkedIn Ad properties. For example, you can create a list of contacts with an Adwords Conversion property value of "true". Please note: as of July 31, 2017, the LinkedIn Ads integration has been removed from HubSpot. Any LinkedIn campaigns originally created in HubSpot will continue to run in LinkedIn Ads. 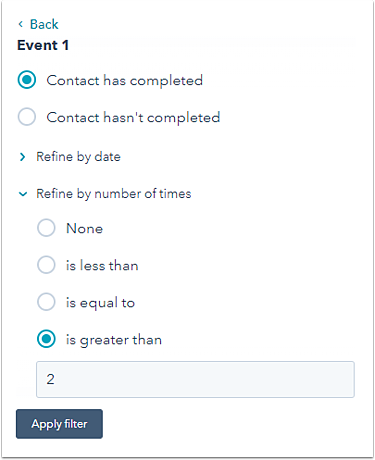 List criteria can be combined in multiple ways to filter contacts on more granular levels, and AND and OR logic can be used with multiple criteria sets. 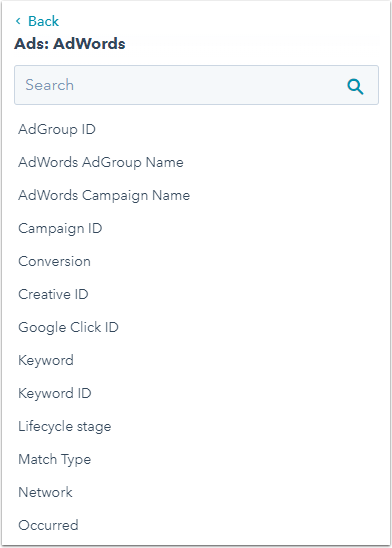 For example, you can create a list of contacts who became a sales qualified lead in a certain time and has their first name known, or contacts that converted through AdWords. 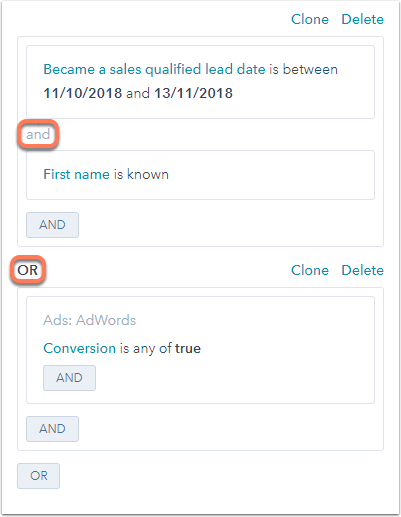 This will result in a list that includes both contacts who became a sales qualified lead between the specified dates with their first names known and contacts who have converted through Adwords.